With the 27th pick of the NBA Draft, the CelticsLife hive-mind selects...Harry Giles. Of course, as regular readers know, much of this article's topic is purely academic, covering the potential but incredibly unlikely possibility of the Boston Celtics retaining their own pick, which will fall 27th in the first round of the 2017 NBA Draft. I say it is unlikely because some very improbable factors will have to come into play for such a scenario to play out - namely, Boston needing some of the Brooklyn Nets' cap space or players to complete a deal - but in the interest of due diligence, we've gone the distance and laid out a choice of four potential prospects for readers to choose from, and choose you did, a one Harry Giles. And that is, perhaps, a fitting choice for such a spectral pick. Giles, as recently as last summer, was a consensus top-three prospect, but repeat surgeries took the bloom off his rose as scouts and analysts became concerned the explosive athleticism which made him such a special prospect might be permanently diminished, or an injury away from so being, if not. Giles' season at Duke - a late start that did not exactly signal the greatness some saw in his game early on, and a season many suggested should have been skipped altogether - has done little to help ease concerns, and may have even harmed his stock. But he has seen it rise in the estimation of some analysts in recent weeks, with some suggesting he may go early in the lottery with the right kind of results coming back from the intense medical scrutiny he is to undergo as part of the NBA Draft Combine. 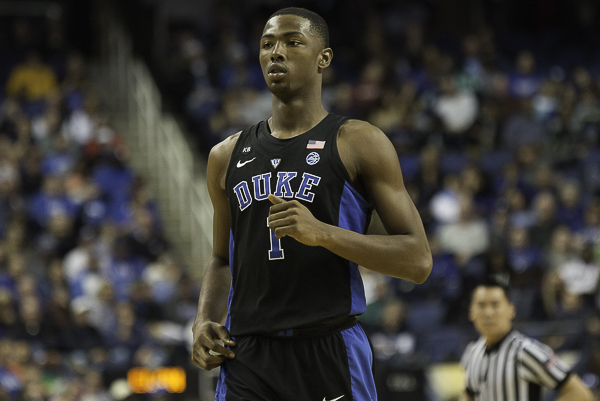 Should the #Hornets take a chance on Harry Giles? So, it may also be academic to select a prospect 27th with a pick unlikely to be used by Boston considering the player may also be unavailable should the young man finally catch a break - and early results suggest he may. Registering a 32.5" max vertical and a 27" no-step vertical places Giles fifth and ninth among centers respectively, his 7'3"1/4 wingspan eighth (with several ties), standing reach tied for seventh, and the least body fat of any center prospect at the combine. Of course, none of this matters should his medical reports come back even slightly questionable, and none of this matters to Boston fans unless his stock ends up slipping until the 36th pick, the soonest after whatever pick the Nets pick swap order produces that the Celtics will definitely control. Still, it's a potentially useful exercise to be aware of the politics surrounding Giles' draft position, as well as why he's in the conversation from anything between a lottery pick and the second round in the first place. The 23 points, 16 boards, 1.8 steals and 2.1 blocks per-40 minutes sample he's put together to date imply that with good health and the right development, a monster of a player might be had should a rocky start prove to be the worst of things haunting the nascent NBA career of Giles. That's saying a LOT for a player who attempted precisely zero beyond-the-arc shots in his time at Duke, which is part of why Giles is such a tantalizing prospect. With the athleticism that has scouts drooling, Giles can outmaneuver most bigs to get boards, can move with agility and soft hands on offense, making good use of his reach to finish well, and can keep up with most players in transition. He's an engaged defender who attacks the rim for rebounds, and has few dings in his game aside from the lack of shooting and injury history we've already discussed, perhaps too much for a prospect unlikely to be relevant to when Boston selects, save for an odd surprise or unexpected draft night deal. Swanigan is exactly the type of player Boston fans are known for loving (perhaps to a fault) - a gritty underdog who fought through personal hardship and events beyond his control - having overcome obesity and homelessness to become a top NBA prospect many assumed would go in last year's lottery, until combine results proved a rude awakening, with estimates coming in near or past the end of the first round. Caleb took this bad news the right way, however, and improved on the areas where his game took the biggest criticism - most notably shooting. A little undersized to play the 5 in the NBA at 6'9, Swanigan plays above his height with an NBA-ready frame and a craftiness that belies his 250-llb body - and his 44.7% three-point shooting with 2.4 attempts per game make him a matchup nightmare. Tuesday night, we will know the exact order of the 2017 Draft, when Wyc Grousbeck will represent the Celtics as we learn the position of the pick the Celts will control via the Nets. We'll check in with one more edition of this series at that time, as we narrow the possibilities with your help. Unlike the earlier iterations, the depth of this draft will require a different approach, with CelticsLife readers selecting from a pool of EIGHT potential candidates the final four we'll analyze at length. Then, from those four, you'll choose the CelticsLife reader-endorsed Nets pick selection prospect, so we can collectively pat ourselves on the back - or shake our fists in unison at Danny, Wyc and company - depending on how things shake out. But for now, we've got some unfinished business to take care of at home, and until that's out of the way - you know what we're talking about - we're locked in on defending home court from here on in.